The idea behind this item is two fold. To firstly protect the cargo area of the bike with the pillion seat removed - the plastic is too easily scratched for my liking. And secondly to provide a stable wear resistant area for cargo. The design is an evolution of an original design which has been improved by input from the lads on the www.ukgser.com forum. It`s very easy to fit with no drilling required and comes with replacement fasteners and spacers which hold the plate just about the plastic pillion plate though you don`t have to use these and you can fasten it down without using them. It locates on the 4 pannier rail fastening points. 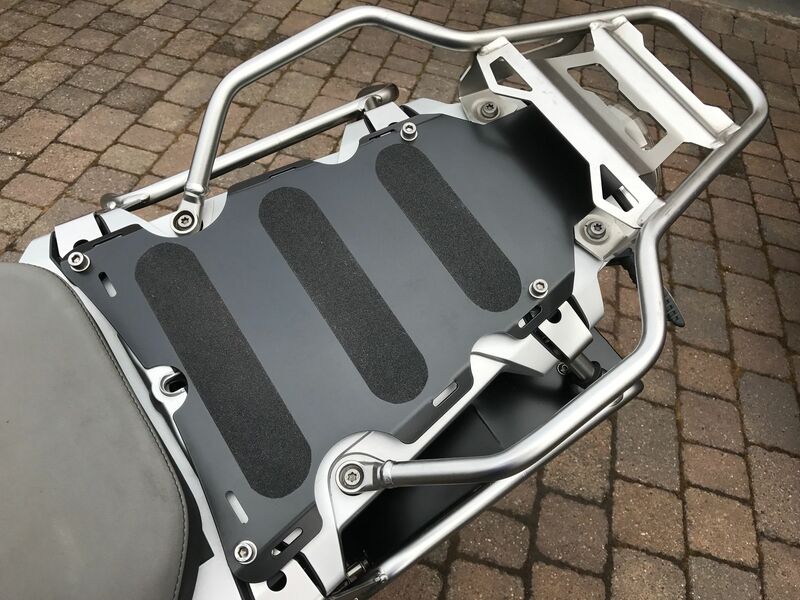 This variant is the one I have fitted to my bike and is in aluminium and finished in black with anti slip patches on it. It`s not as durable as the stainless steel one but it`s much lighter.